"The list is an absolute good. The list is life." It may have taken a long, long time, but finally Steven Spielberg's powerful Holocaust film—a well-deserved Best Picture winner from 1993—has come to DVD, and while the wait has been interminable, the payoff has been definitely well worth it. 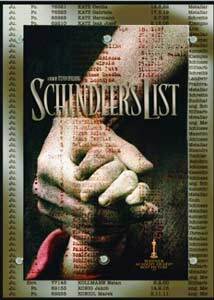 Based on the real-life Oskar Schindler (Liam Neeson), Spielberg's epic-length film (clocking in at 197 minutes) is the story of the wholly self-absorbed, womanizing, capitalistic, Nazi Party member who amassed a veritable fortune using cheap Jewish labor for the war effort during the German occupation of Poland in the early 1940s. What Schindler was able to do, perhaps accidently at first, was to spare imprisoned Jews from certain death, and, as he gradually became more aware of the growing brutality and genocide, he spent his own money to literally purchase men, women, and children, to keep them as laborers and spare them the atrocities destined for them at death camps like Auschwitz. This is the kind of stunning, punch-to-the-gut filmmaking that Spielberg maybe isn't necessarily known for by the masses, purveyor of big budget multiplex action adventure that he is, though certainly films like The Color Purple and Amistad have legitimized his ability to create deep, moving, and serious pieces when he wants to. The sledgehammer intensity of Saving Private Ryan and its opening twenty-minute D-Day invasion is another one of those near-perfect examples of Spielberg's penchant for powerful and explosive filmmaking, though clamped onto a film that often struggles under its own weight. A film like Schindler's List, on the other hand, manages to sustain its weight for the duration, and the horrific, startling images (and there are many here that often erupt quite suddenly) are somehow buttressed by the film's underlying message that one man can make a difference. Admittedly, it's tough to mine any sort of inspiration from the widespread slaughter that was the Holocaust, but the story of Oskar Schindler and the people he saved is steeped in it, and Spielberg is a talented enough filmmaker and storyteller to actually carry it off. The film is blanketed by three especially strong performances, from Neeson, Ben Kingsley, and Ralph Fiennes—all sporting a variety of potentially troublesome accents without a hitch, in addition to carrying the narrative. Neeson, here a far cry from the comic book readings of The Phantom Menace, shows solid acting chops as Schindler, and his superbly emotional unraveling during the final scenes is one of the standout moments of the entire film. Kingsley, as Schindler's Jewish accountant/business associate, seemingly becomes Itzhak Stern, and once again proves himself to be the kind of actor that is capable of vanishing into a character. Though working for Schindler, Stern was always a potential liability under the eyes of the Nazis, and Kingsley quietly exudes a tight blend of fear and courage that seems truly genuine. As Nazi labor camp commander Amon Goeth, Ralph Fiennes has the unenviable task of epitomizing the villainy of the regime, and, for once, we aren't given a typically scar-faced, Snidely Whiplash German to despise. Fiennes' good looks make the vileness of his character even more difficult to compartmentalize, and he keeps Goeth's insecurities and idiosyncrasies just below the surface, revealing them in small bursts. In one scene, Goeth is selecting a housekeeper from a line of frightened Jewish women at the Plaszow labor camp, and when he selects Helen (Embeth Davidtz), he seems concerned that he might pass his cold onto her. This sliver of humanity is shattered moments later when orders a female engineer shot on the spot after a construction project is revealed to be flawed, or as he randomly shoots Jews from the balcony of his villa overlooking the camp. Schindler's List is an evocative piece of storytelling from Spielberg and cinematographer Janusz Kaminski, deserving of all of its praise and recognition. It is impossible to really paint a happy ending on events that were so unspeakably heinous, but in this isolated chapter of a larger whole, the 1100 lives Schindler eventually saved come as close as possible. Image Transfer Review: Universal's seemingly flawless 1.85:1 anamorphic widescreen treatment of Schindler's List could easily become a reference disc for showcasing the strength and beauty of black-and-white cinematography, in this case the powerful work of Janusz Kaminski. Contrast levels are really first rate, and blacks are spot on, giving the film a rich, noirish feel during some segments (Neeson's Schindler smoking a cigarette in a nightclub) or a harsh, near-documentary feel during others (the horrific ghetto massacre), and the image detail is razor sharp. The print itself appears to be absolutely pristine, and compression issues or edge enhancement are nonexistent. This is one beautiful presentation. Audio Transfer Review: Audio is presented in both DTS and 5.1 Dolby Digital Surround, and while this isn't the most active surround mix I've ever come across, there is a proper amount of decorum in how and where rear channels are used. It is this reserved usage of surround cues that make things like distant gunfire during the ghetto massacre really stand out for enhanced dramatic effect during what is largely a front-centric sound mix. The differences between the 5.1 and DTS are negligible, though I detected a more pronounced .LFE with the DTS track, but both do offer full-bodied imaging and separation across the front channels. French and Spanish 5.1 Dolby Digital Surround tracks are also included. Extras Review: The extras are understandably understated (no blaring trailers for Charlie's Angels: Full Throttle or the like), but substantive where it counts. Voices from The List is an 80-minute documentary from Laurent Bouzereau about actual "Schindler Jews," and this is such an incredibly moving film in its own right that it could have easily been a standalone release. The fact that is included here on this DVD makes the absence of any Spielberg production featurettes easily tolerable. These survivor stories run the full gamut of emotion, and their words are both inspiring and gutwrenching. This is a remarkable documentary that is a perfect compliment to Spielberg's film. The Shoah Foundation Story (11m:25s) is a well-done promo piece for the foundation, narrated by Morgan Freeman, that documents the mind-boggling job of cataloging and indexing over 52,000 survivor stories that, in Spielberg's words, uses "survivors as educators." Also included is a brief text bio of the real Oskar Schindler, as well as filmographies of the principal cast and crew. The disc is cut into 40 chapters, and features optional subtitles in English, Spanish, and French. This is a two-sided disc, with Side A running 02h:13m:37s, and Side B concluding with the remaining 01h:01m:25s of the film. Viewing Schindler's List is an incredibly emotional and intense experience, and were it not based on documented, recent history, the portrayal of wanton violence and genocide would seem just too fantastic to comprehend. Universal has done an exemplary job on all aspects of this long overdue release, and its subdued and dignified packaging add to the overall presentation. This a required addition to any film enthusiast's library.